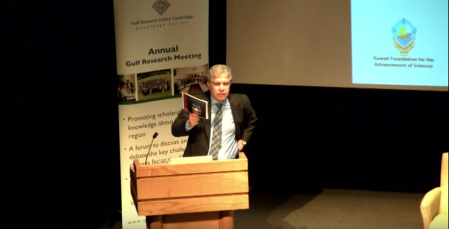 Screenshot of a 2015 lecture by Dr. Bahgat Korany. Two streets away from the finishing line of the Boston Marathon bombing’s site of 2013, and a few days after the announcement of Donald Trump winning the race to the White House, around 2000 experts and students of Middle Eastern studies gathered in downtown Boston to take part in the famous annual convention of the Middle East Studies Association (MESA). Many individuals came to participate in the convention’s 300 panels; some to seek job opportunities, few to attend meetings, but almost everyone came to also seize this opportunity to socialize with colleagues. While the television screen in the hotel lobby was split into equal squares, with three CNN discussants commenting on the selection of Michael Flynn—an ex-general who was sacked for incompetence and who is remembered as saying that Islam is an ideology masquerading as religion—as a National Security Advisor in Trump's forthcoming administration, members of MESA were in session voting in favor of a resolution to edit out the word “nonpolitical” from the influential association’s bylaws. The step was necessary to move closer towards the cause of adopting a boycott, divestment and sanctions (BDS) against Israeli academic institutions. In addition, as some MESA members see the issue, it is an accurate description of some of the projects that scholars in the field are engaged in, and protects MESA from frivolous legal claims. What should be the role of academics in the field, in terms of influence within academia and reaching beyond it? An important development that came on the heels of Trump’s win is the surfacing of watchlists produced by uber-nationalist ‘ultra-right’ activists; reechoing the mood of the McCarthyist era and targeting several “leftist” and Middle Eastern studies experts and students. For a long time, MESA has drawn a plethora of accusations; ranging from irrelevance to US national interests, to ideological preferences in representing Middle Eastern people and the causes of the regions’ civil society, and of being overtly critical of US foreign policy and involvement in the Middle East. What do such challenges mean for MESA scholarship? What is its position in relation to other academic disciplines? What should be the role of the academics in the field, in terms of influence within academia and reaching beyond it? Should it be a tribune of voices from the region, or a distant, objective examiner? When I sat down with Beth Baron, president of the 2016 MESA, to ask her these questions, she started by answering: “While the region is under tremendous stress, the field is blossoming. The scholarship is cutting-edge.” She shares with other MESA specialists the opinion that one of the reasons for such quality of scholarship is the inclusion of many scholars from the Middle East, who bring with them cross-disciplinary insights. There are other factors, of course, including the internet, which made studying the region easier in real-time, as well as the mounting focus on field research, and not just textual analysis, or the introduction of new special academic programs and journals. She also noted that, “history, in specific, is becoming thematically sophisticated”. But the picture is not as bright as we might think. As a field, Middle Eastern Studies (MES) is an area-study that has had its share of controversies and politicization. This year’s MESA convention is special. It is special because of the immediate context; both the atmosphere in the post-Trump, ‘post-fact’ US, as well as the turmoil shaking up the Middle East and lurking in the background (I believe the world has always been post-fact. Trump only mastered manipulating that condition). Whether a publisher, or a presenter, a PhD candidate, or a tenured academic, the name Trump found its way out of the mouths of everyone I met, and rightfully so. “With the ascendency of Trump, we are setting up a task force to study the effects of this new climate on the field as a whole,” explained Nathan Brown, professor of Middle Eastern law and politics at George Washington University, and a former president of MESA himself (2013-2015). “One of my concerns and focuses will also be to create a safe environment in the classroom, not just for my Middle Eastern students, but for Trump supporters as well--agreement is not a goal but understanding is,” as he emphasized. There is definitely better societal outreach and influence on policy, according to him. Still, this does not seem near enough, especially with regard to US policy on how to combat terrorism, an issue which became a defining theme of US foreign policy. It might be said, however, that just like other area-studies, which are all by definition inter- and multidisciplinary (combining history, literature, language, and politics); MES has been painted in a somewhat contemptuous light, compared to disciplinary sciences, like political science and history. Although this tension is not exclusive to it, yet it takes a special dimension in relation to MES. Experts in disciplinary sciences often argue that area studies are lacking in theoretical rigor, as well as for insufficient inclusion of the ‘universal’ ideas and principles that permeate disciplinary methodology. Another aspect of the criticism targeting area studies is their lack of instrumentality in serving policy, particularly US foreign policy. These reasons have inspired Martin Kramer, a controversial Middle East expert who previously served as a senior advisor to Rudy Giuliani in 2007, to author a widely-read book that is highly critical of the field, Ivory Towers on Sand, which calls for bringing the field back to orientalist roots, in order to serve imperial-like needs. His book is especially critical of two theoretical subjects in the MES: democratization and civil societies. When compared to MESA, which is known for its rejection of orientalist discourse, the Association for the Study of the Middle East and Africa (ASMEA), with its far fewer members, wields much more clout in terms of influence on US foreign policy. Kramer, along with his mentor Bernard Lewis, an arch-authority in orientalist approaches studying the Middle East, co-founded ASMEA. Such concerns were previously successfully utilized as a case against funding MES in the US after 9/11; culminating in 2003 with the US Congress passing the International Studies in Higher Education Act H.R. 3077, creating an inquisitorial advisory committee to oversee teaching of MES in US universities. MES also has its own counter-argument against social science disciplines. MES experts who are in the thick of this tension argue that it is the parochialism of disciplinary social sciences, and their one-size-fits-all view and first-world-focused universal principles that are at the crux of this tense relationship. In a valuable paper by Pinar Bilgin, a professor of International Relations at Bilkent University, entitled: "What Future for Middle Eastern Studies?" she argues that in the light of this tension, there are three possible futures for MES; first, going back to the orientalist roots of MES, as suggested by Kramer, second, MES aligning itself with disciplinary theory and method, or, third, more innovatively, using interdisciplinary, cross-disciplinary, and comparative insights to strengthen and completing disciplinary sciences through ‘testing’ and modifying the applicability of their theories in real world contexts; thereby freeing disciplinary sciences from their self-inflicted parochialism and western-centrism. In October this year, Kramer stood in front of an ASMEA crowd and delivered a speech in which he cited the failure of interdisciplinary MES in predicting the 'Arab Spring' as proof of the superiority of his proposed approach. Pinar’s argument of focusing more on non-state actors, and away from the western interest-focused, orientalist outlook, seems to be a more balanced solution that surely would not only strengthen disciplinary theories, but also help predict social phenomena; even though prophecies and predictions are not the objective of academic research. MES enriched academia worldwide with valuable contributions, like the critical theory of orientalism and other valuable contributions to postcolonial criticism. But this tension does not equally affect MES in all disciplines, as relations with different disciplinary sciences differ. There is of course a difference in applying theory in MES, as emphasized by Bahgat Korany, one of the most renowned authorities in the field of MES, between the perception of the role of theories in soft sciences (history, sociology, anthropology), on the one hand, and in hard sciences (economics, and psychology). With the region being battered by the tumultuous times of our age, MES is facing increasing challenges, some of which are challenges ‘from above,’ that are common with other area studies, like disciplinary analytic pretension, and others from outside the field, like diminishing funds and ideological attacks by opposing political actors and institutions. Other challenges are particular, like the politicization of the field by voices from within and without, something that will surely exacerbate under Trump’s reign. Other challenges ‘from below,’ include the dangerous environments in the Middle East and restrictions on academic freedom and freedom of expression. Listening to voices of people and experts from the region itself is surely lacking, and is welcome. This will certainly help the field put disciplinary theory and method to task. It can be said that it is these mounting challenges that face this particular field, rather than any claims to the particularism of the region, that are likely to make the field stronger, in the same way that the field has enriched academia worldwide with valuable contributions, like the critical theory of orientalism and other valuable contributions to postcolonial criticism. A shorter version of this article was published by The National on February 16, 2017 under the title Under historic challenge, what is the future of Middle Eastern studies?